It would be unthinkable to visit San Francisco and not ride a cable car at least once. On the other hand, there are more convenient ways to get around The City. 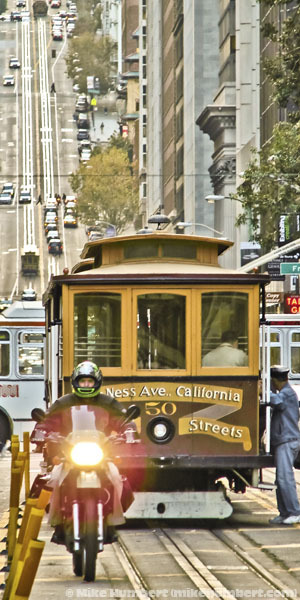 Cable cars were introduced back when horse-drawn wagons struggled to climb the steep San Francisco hills. 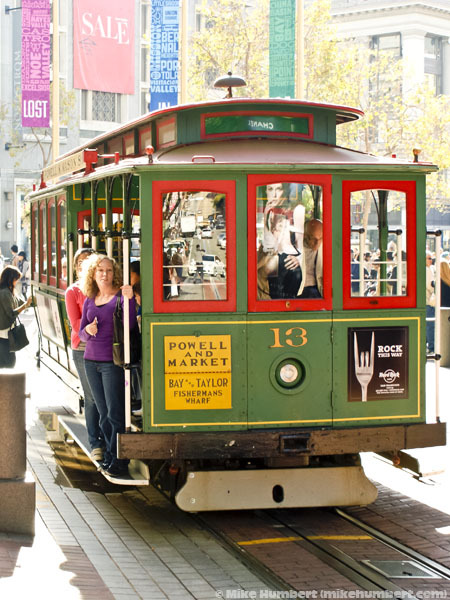 After the idea proved successful here, many other cities adopted cable car systems. Only San Francisco still has theirs. 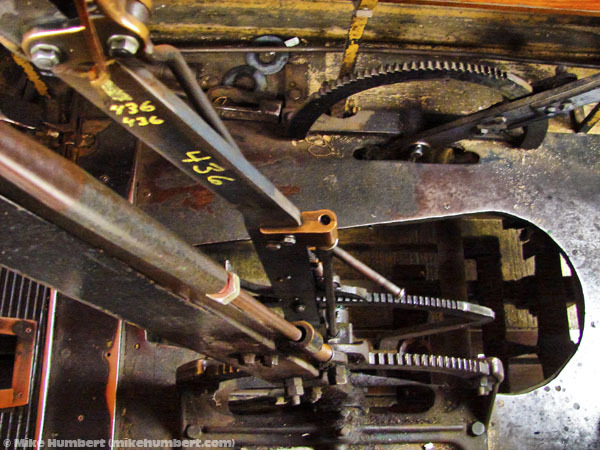 Like trains, cable cars have steel wheels, which fit into a special track. 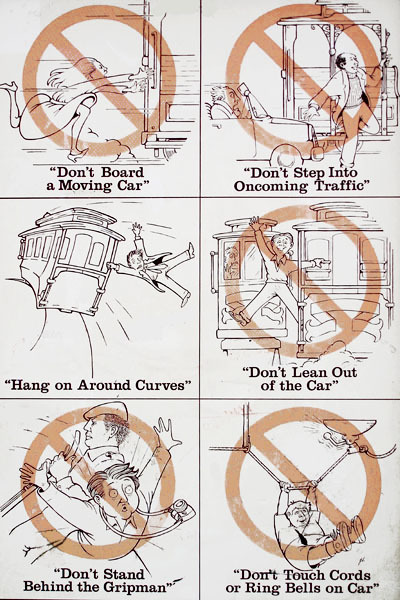 Unlike trains, cable cars have no onboard engine at all, but are pulled along by a moving cable under the street. Rule of thumb: if it has tires and a licence plate, it’s not a cable car. It’s just a tour bus made up to look like a cable car. 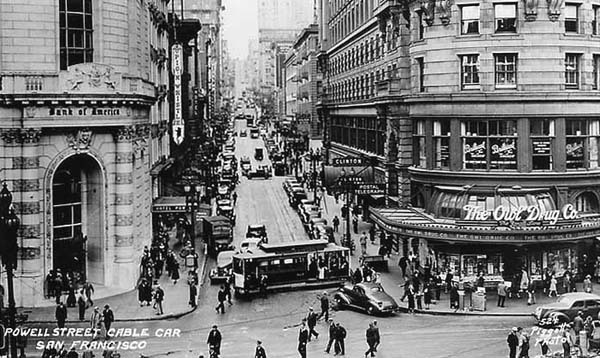 The San Francisco cable car system was once quite elaborate, but today only three lines remain (which have been awarded landmark status). Two of these lines depart from the turntable at Market & Powell Streets. 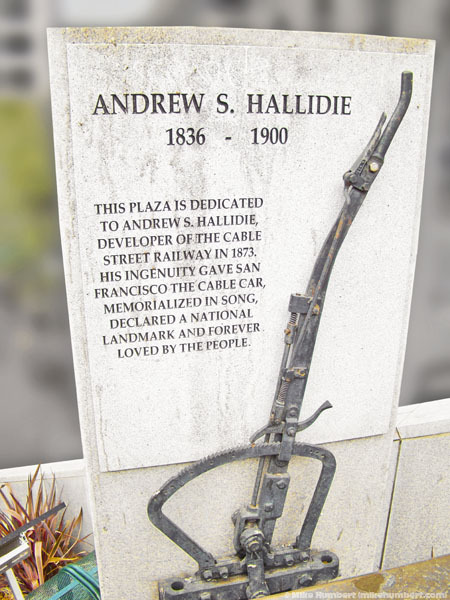 The Powell-Hyde line will take you to west end of Fisherman’s Wharf. 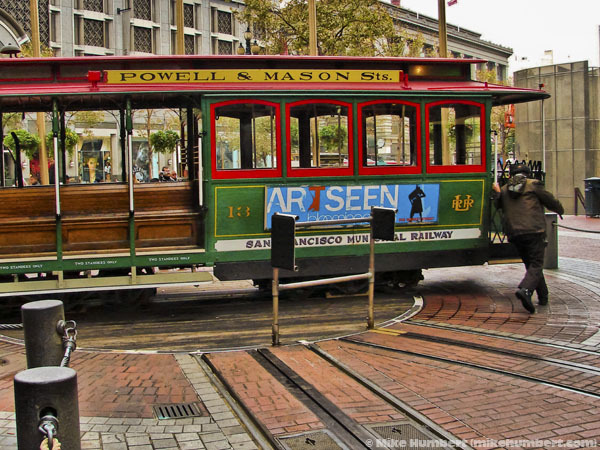 The Powell-Mason linewill take you closer to the middle of Fisherman’s Wharf. The cost is $6.00 per person, for a one-way trip. 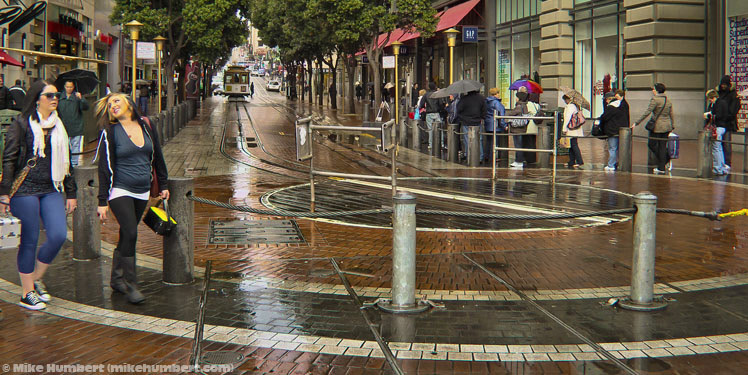 The turntable is used to pivot the cable car around to make the return trip to Fisherman’s Wharf. There are a total of three turntables on the Powell-Hyde and Powell-Mason lines, but the one at Market & Powell gets photographed the most. 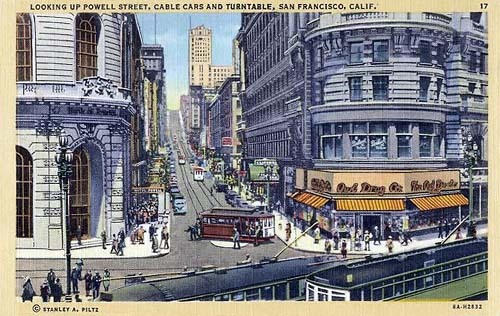 Postcard publishers have always loved the cable car turntable at Market & Powell. 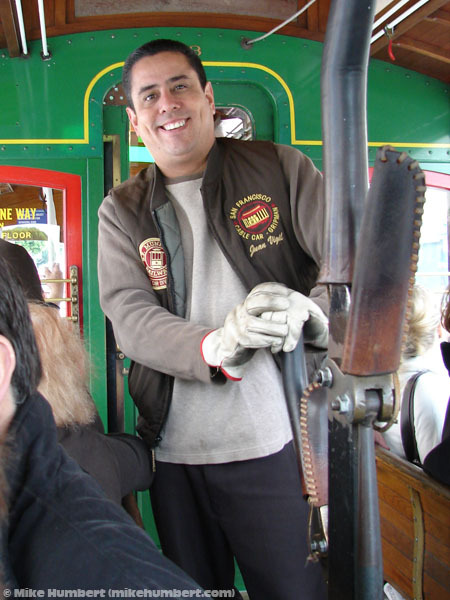 Cable cars have a two-person crew: The conductor, who collects the money, and the gripman (who usually is a man, but not always), who operates the massive metal grabber that “hangs on” to the underground steel cable, which pulls the car along at a constant nine-and-a-half miles per hour. When the gripman wishes to slow down or stop, he (or she) releases the grip on the cable. Cable cars are a world-class tourist attraction. 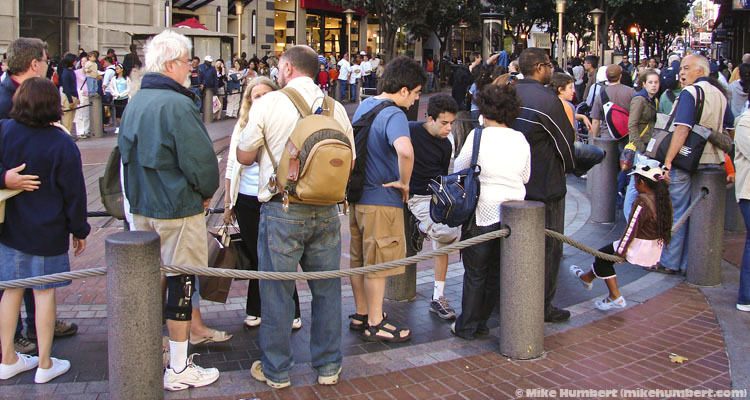 It’s normal to line up for an hour or more, and three hour waits are not unusual. Lines are shortest early in the morning and late at night. 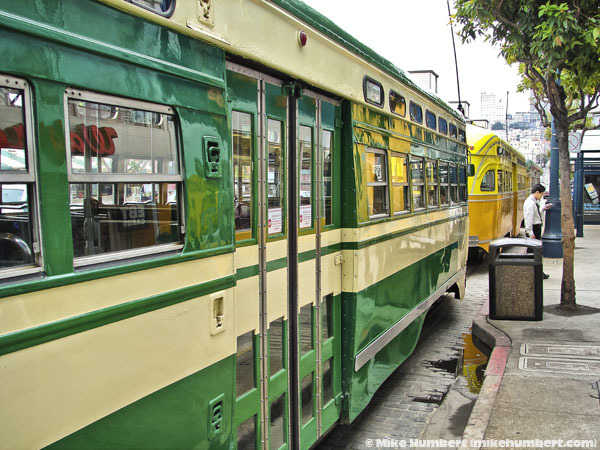 If all you want to do is reach Fisherman’s Wharf, consider taking an F-Market streetcar, which will be far less expensive, and is often less crowded. 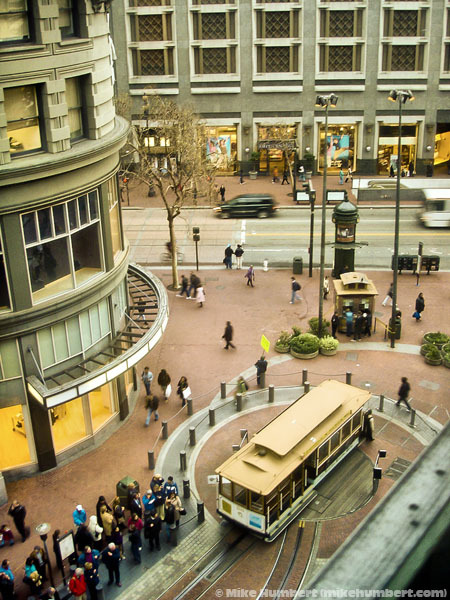 The F-Market line stops all along Market Street and the Embarcadero. 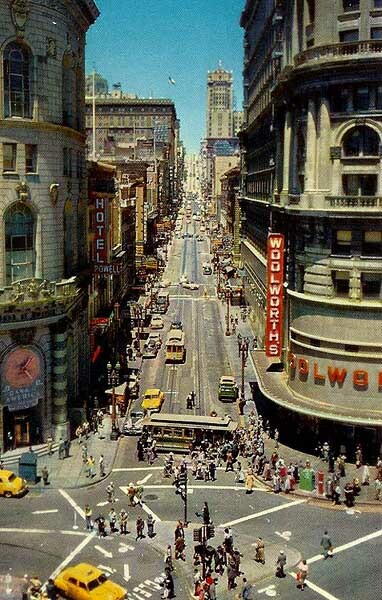 If you’re not that concerned with Fisherman’s Wharf, and just want to experience a cable car, you should walk down Market Street to the intersection of California & Drumm (next to the Hyatt Regency). 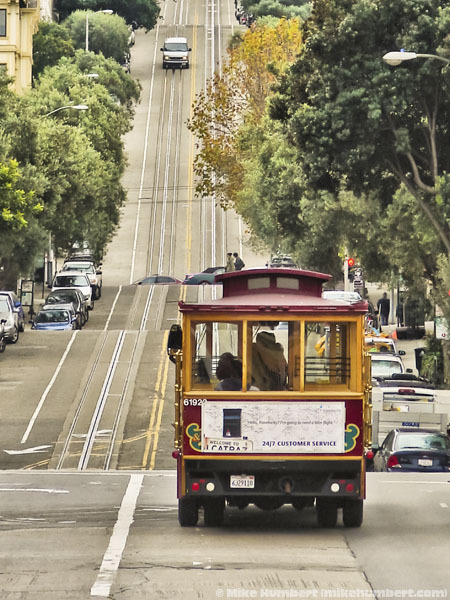 The California cable car line is always less crowded, and you’ll climb some steep hills and pass through Chinatown. On the downside, you end up at the not-at-all-exciting destination of California & Van Ness. It should go without saying that unexpectedly firing a flash camera into the eyes of the person controlling the vehicle is a really stupid move. Yet, I’m told, people do it all the time. Use a little common sense and ask permission first.